At this price, it's a bargain buy that covers many bases. Huge variety of amps and effects models. Interesting routing options. Looping. Cheap. 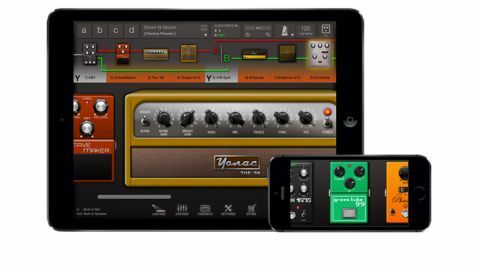 A relative newbie to the iOS amp app world, ToneStack offers six amps and cabs and 21 effects, and can be expanded via in-app purchases to 24 and 71, which Yonac says is the largest collection on iOS. "You can run up to 64 amps and effects simultaneously"
What's more (CPU limitations permitting), you can run up to 64 amps and effects simultaneously, giving plenty of scope for creating new sounds, particularly as there's a signal splitter to run dual-amp setups or switch or blend effects. You also get a two-track recorder (expandable to eight) and a 'Tapedeck' that features looping and phrase training facilities - record into it or play songs from your music library.